Ashley Heitkamp joined Brudvik Law Office in 2017. Ashley started her legal career as a law clerk for the United States District Court of North Dakota, for the Honorable Judge Ralph R. Erickson, District Court of North Dakota where she was responsible for legal research and drafting various memorandums and orders. 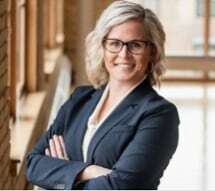 Ashley then served as an Assistant State's Attorney for Stutsman County, North Dakota where she handled jury trials and argued successfully in front of the North Dakota Supreme Court. Prior to joining Brudvik Law, Ashley worked as Corporate Counsel for Catholic Health Initiatives, where she focused on contract law and health law. Ashley grew up on Lake Elsie near Hankinson, North Dakota. In 2006, Ashley graduated from the University of North Dakota with a bachelor's degree in political science and communication. After college, Ashley attended Marquette University where she was chosen to compete in Jenkins Moot Court, which is comprised exclusively of the top grade-earners in appellate writing. Ashley spends most of her spare time at the lake with her husband and three children.